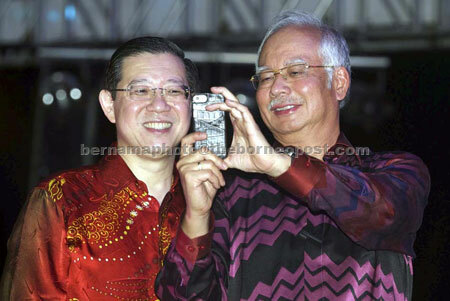 GEORGE TOWN: Prime Minister Datuk Seri Najib Tun Razak opened the Second Penang Bridge on Saturday night with more than 10,000 people attending to observe the historic event of the unveiling of the country’s latest iconic structure. Najib, dressed in black and purple, arrived at about 8.30pm accompanied by his wife, Datin Seri Rosmah Mansor, Works Minister Datuk Fadillah Yusof and Penang Chief Minister Lim Guan Eng. The arrival of the prime minister and his wife was greeted by the song ‘1M4U’ and people were seen rushing to shake hands and having their photographs taken with the prime minister while some shouted “I Love PM”. Also present at the event were former prime minister Tun Abdullah Ahmad Badawi and wife Tun Jeane Abdullah, former Penang chief minister Tan Sri Dr Koh Tsu Koon, Malaysia’s special ambassador to India and South Asia who was also former MIC president, Datuk Seri S Samy Vellu and Kedah Menteri Besar Datuk Mukhriz Tun Dr Mahathir. Others present were Minister in the Prime Minister’s Department Datuk Seri Abdul Wahid Omar, Penang Gerakan chairman Teng Chang Yeow, chief executive officer of the Northern Corridor Implementation Authority (NCIA) Datuk Redza Rafiq and state executive councillors. As soon as Najib opened the second bridge, the sky above Penang island was lighted with a fireworks display. The prime minister and his wife also boarded an ‘open top’ double-storey bus from the Batu Maung junction up to the middle span, where the arch of the bridge is located. After a five-year wait, the new bridge, the longest in South-East Asia, opened to the public at 12.01 midnight for the people to see for themselves the unique structure of the bridge and the toll plazas, said to be the biggest in the country with 28 payment kiosks. The 24km-long bridge, of which 17 kilometres were built over the sea and seven kilometres on land, will stimulate the economic growth of the state, particularly the industrial zone on the mainland at Batu Kawan. Besides reducing the congestion on the Penang Bridge, the new bridge, mooted by former Prime Minister Tun Dr Mahathir Mohamad and realised by Tun Abdullah, will narrow down the social and economic development gap between Batu Maung on the island and Batu Kawan on the mainland. The mega project, costing RM4.5 billion, was handled by the contractor China Harbour Engineering Co Ltd (CHEC) while Jambatan Kedua Sdn Bhd (JKSB) is the concession holder for a period of 45 years. Besides being constructed using an environmental friendly design, the second bridge can withstand tremors of up to 8.2 on the Richter scale at a distance of 300km from the epicentre of the quake.